French companies are being urged to do all they can to prevent stress in the workplace after a spate of suicides. Labour Minister Xavier Darcos wants the 2,500 biggest French firms to negotiate anti-stress strategies with unions by February 2010. At France Telecom, 24 employees have taken their own lives since 2008. As part of the announcement, firms in the process of restructuring are being asked to factor in the psychological risks of the transition. Speaking to a council on work conditions, Mr Darcos said that because physical risks were easier to spot than psychological ones, they were often underestimated. He added that this had been demonstrated at France Telecom "in a particularly tragic way". The government, which is France Telecom's biggest shareholder with a 27% stake, has been closely involved in trying to manage reactions resulting from the suicides. Unions blame restructuring and work pressure at the firm for the tragedies, saying that some staff are being left behind in the firm's transformation from a government agency to a private company. 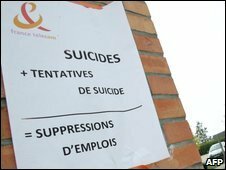 But France Telecom says the rate of suicides is statistically not unusual for a company with a 100,000 workforce. According to the World Health Organization, France had an annual suicide rate of 26.4 for 100,000 men in 2008. The rate for women was 9.2 suicides per 100,000. As part of the measures, Mr Darcos also called on small and medium-sized companies to spot problems early, with support from workplace health services. He confirmed that a dedicated body would be created to advise firms and monitor those which were slow to act. A report will be made public on a dedicated website and a second plan on workplace health will be put forward by the end of 2009.